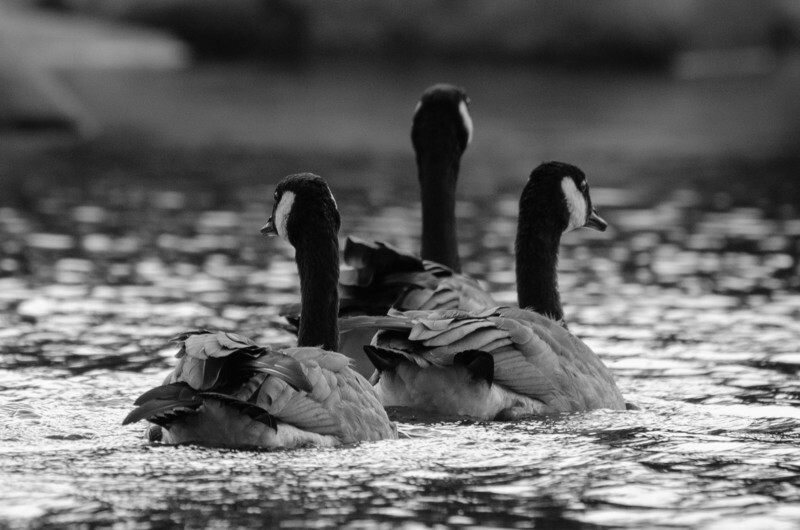 While I'm on my black and white kick, here's Canada geese at Wrights Lake in the northern Sierra. The photo was taken from a kayak. The focus is a soft on the goose in front. But the composition is strong and helps overcome the shallow depth of field. It's hard in a boat -- especially on a cloudy afternoon -- to shoot fast enough to freeze the action and at a small enough aperture to get a depth of field. The telephoto lens makes the geese look closer than they actually were. Camera & Lens: Nikon D5100, Nikon 70-300mm telephoto lens at 300mm, ISO 400, f/8, 1/320th. Shot in RAW and processed in Lightroom. Buy a print here! SmugMug does a nice job through Bay Printers and prints are very modestly priced. I pump any money I make back into my photography (read: the Nikon D7100 I think I want to buy).